Just five days ago, Rays No. 3 prospect Brendan McKay set a career high with five RBIs. On Thursday, the two-way star reached a milestone in his other occupation as a pitcher. The No. 25 overall prospect hurled six innings for the first time as a pro, allowing just one hit and punctuating his final frame by striking out the side on 11 pitches as Class A Bowling Green bested Cedar Rapids, 4-0. Hot Rods manager Craig Albernaz has been impressed with his left-hander from the start of the season. "He just pounds the zone with his fastball. He spins it for strikes, he has a good breaking ball and has a good changeup," Albernaz said after McKay's previous start on May 4. "That's one thing with him, he just continues to pound the zone and puts the hitters in swing mode, and then he can expand the zone with other breaking stuff and off-speed stuff." The former University of Louisville star needed just 54 pitches -- 43 of them strikes -- to retire 18 of the 19 batters he faced and didn't issue any walks. Only David Banuelos, who lined a single to left field with one out in the third inning, reached base against the left-hander. 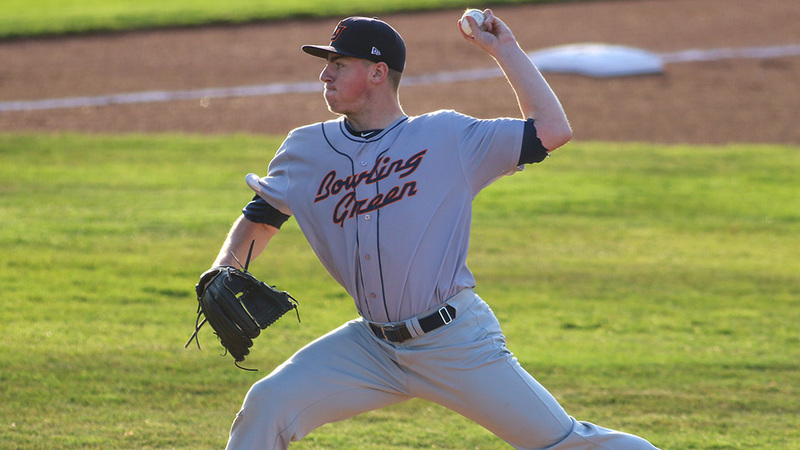 McKay's previous longest outing was five frames, which he had done in Class A Short Season Hudson Valley's victory over Lowell last Sept. 4 and again in Bowling Green's win over Lake County on April 28. "We're gradually building him up," the manager said, "because the end game is to get him to the big leagues on both sides of the ball. So with pitching, we're just making sure he's getting his work in and getting the proper rest and building up his innings and his pitch count gradually." The fourth overall pick in last June's Draft lowered his ERA to 1.09. In 24 2/3 innings, he has allowed just eight hits while walking two and fanning 40. Opponents are batting just .096 against him. And he's accomplished that while posting an .827 OPS as a batter, including a .483 OBP amassed largely through 26 walks in 87 plate appearances. The 22-year-old has struck out just 13 times. And unlike No. 1 overall prospect Shohei Ohtani, who typically gets days off as a position player before and after he pitches, McKay played first base Tuesday and was the designated hitter Wednesday for the Hot Rods. "I was impressed with him last year … especially with all the hype and notoriety that came with him," the Hot Rods manager said. "He had all those accolades from college, well-earned and deserved, and he came in as a hard worker, great teammate, great clubhouse guy, and it's more of the same this year. He fits in well, he brings it every day. Especially with doing what he does playing both sides of the ball, you have to work hard. And that's been something I've been impressed with from day one." Before the Draft, the Golden Spikes Award winner said he would oblige if the team that selected him wanted him to choose between pitcher or position player. But the Rays gave the Darlington, Pennsylvania native the second-highest signing bonus ($7,007,500) under the current set of Draft rules and have embraced McKay's desire to pitch and hit. On Thursday, McKay faced a Kernels lineup loaded with some of the top Twins prospects, including No. 1 Royce Lewis, baseball's No. 21 prospect. Sixth-ranked Alex Kirilloff, No. 11 Akil Baddoo, No. 19 Andrew Bechtold, No. 23 Ben Rortvedt and No. 28 Jose Miranda also were all in the lineup. Although none of them got a hit off McKay, Kirilloff tripled against reliever Jhonleider Salinas in the seventh. Meanwhile, the Hot Rods served up plenty of offense. Moises Gomez doubled twice on a three-hit night and drove in two runs, and Vidal Brujan, Taylor Walls and Zach Rutherford each singled twice to pace a 12-hit attack. Salinas allowed one hit and struck out three over 2 2/3 innings and Phoenix Sanders fanned the final batter to complete the shutout.